Looking for a cheap lunch at a favorite Vietnamese restaurant, got an education instead. As a Vietnam veteran living in Denver, I attended several April 30, 1975 South Vietnam Remembrance Days with Vietnamese friends. Always a bittersweet affair. Vietnamese men love to talk politics. I remember one man who proudly told me he had just become a American citizen. I asked him what political party he would claim when he registered to vote. Shocked, he said, "Mr. Mike, I'm a Republican. The Democrats are cousins to Communists. I know, I live in Communist prison camp". He went on to remind me that a Democrat Congress had reneged on Nixon's promise to support South Vietnam with materiel. How he hated the Democrats. Off subject, the picture of the sign in the restaurant window reminds me of a sign I once saw. In '74, I was working for a national bank security equipment manufacturer and had been recently transferred to Lexington, KY. One morning in April, I started the day with some bank courtesy calls downtown. The first two banks I went to were closed. I couldn't make sense of it, it felt as though I had entered the "Twilight Zone", what was going on? As I approached the third bank, my questions were answered. 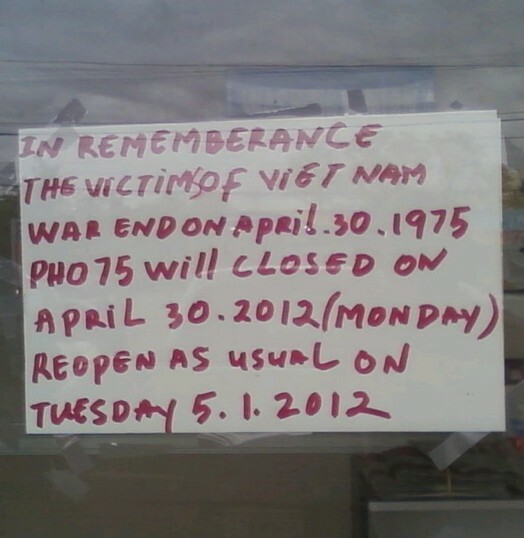 On the door was a sign that read, "Closed For Confederate Memorial Day".